Currency Census Reports - You must log-in to view/purchase the Currency Census Reports. If you do not already have an account on our website, you can register on the form below. Please log-In to your Jhon E. Cash Account to View Census Reports. 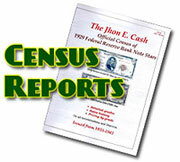 The new 2010 1929 FRBN Star Census vol. IV will is available to download online on May 15th. This census contains over 1,219 1929 FRBN Stars by the serial numbers, grades and important data of all denominations of the 1929 FRBN Star $5, $10, $20, $50, and the $100 bills. All districts that issued stars are included. This is a must have census if you are into US currency as they are prevalent through the currency market. This valuable census is an absolute must for any coin dealer, currency collector, collector or auction cataloger. A photo of each denomination and district is included. Search features included. The full booklet has a lot of additional useful information on the 1929 FRBN Star Notes and is also available soon. Included is the booklet is fun and interesting facts along with statistics on all the denominations and districts. There is also a section with photos about some of the known counterfeits. All photos of all districts and denominations are included in the 2010 Issue IV. The new 2010 1928 and 1934 US small size $500* and $1,000* star census will be available on June15th, 2010. The census will detail all the 177 known $500* star notes and all the 140 known $1,000* star notes. The series 1928 and 1934 will be broken down by series, denomination, district and grade. Comments on most will be included along with photos of each denomination and district. . This valuable census is an absolute must for any coin dealer, currency collector, collector or auction cataloger. A photo of each denomination and district is included. Search features included. The new 2010 1928 and 1934 US small size $5,000 and $10,000 Federal Reserve Bank Official Census will be available online on May 1st. This census will include valuable data on all of the 151 known $5,000 bills and 189 $10,000 bills known by denomination, district and grade. The data is broken down by the series of 1928 and 1934. Additional important and valuable information about some of the notes is also included. This valuable census is an absolute must for any coin dealer, currency collector, collector or auction cataloger. Search features included. The Full version of my book is due out later this year.